Eastern Ukraine or East Ukraine (Ukrainian: Східна Україна, Skhidna Ukrayina; Russian: Восточная Украина, Vostochnaya Ukraina) generally refers to territories of Ukraine east of the Dnieper river, particularly Kharkiv, Luhansk and Donetsk oblasts. Dnipropetrovsk and Zaporizhia Oblasts sometimes are also regarded as Eastern Ukraine. In regard to traditional territories the area encompasses portions of the southern Sloboda Ukraine, Donbas, the western Azov Littoral (Pryazovia). Almost a third of the country's population lives within the region, which includes several cities with population of around a million. 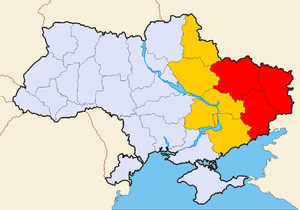 Within Ukraine, the region is the most highly urbanized, particularly portions of central Kharkiv Oblast, south-western Luhansk Oblast, central, northern and eastern areas of Donetsk Oblast. The region stretches from southern areas of the Central Russian Upland to the northern shores of the Sea of Azov, from the eastern border with Russia to Black Sea and Dnieper lowlands (including the left banks of Dnieper) to the west. Aside of Dnieper, the major river of eastern Ukraine is Seversky Donets which gave the name to the main economical region for that portion of the country, Donbas (Donets basin). The territory is heavily urbanized and commonly associated with the Donbas. The three largest metropolitan cities form an industrial triangle within the region. Among the major cities with population of over 200,000 people are Kharkiv, Dnipro, Donetsk-Makiivka, Zaporizhia, Mariupol, Luhansk, Horlivka and Kamianske. Cities of Donetsk and Makiivka create what is known as urban sprawl with very close proximity to other important cities such as Horlivka and Yenakieve. A large majority of voters in eastern Ukraine (83% or more in each oblast) approved Ukraine's declaration of independence in the 1991 referendum, although the numbers were not as high as in the west. In 2014, pro-Russian protests took place in parts of eastern Ukraine. Some of the protesters were "tourists" from Russia. The war in Donbass resulted in thousands of deaths and over a million people leaving their homes. As of 2016, about half of the territory of Donbas is controlled by the self-proclaimed Donetsk People's Republic and Luhansk People's Republic. According to the 2001 census, the majority of Eastern Ukraine's population are ethnic Ukrainians, while ethnic Russians form a significant minority. The most common language is Russian, having long dominated in government and the media. When Ukraine became independent, there were no Ukrainian-language schools in Donetsk. Noticeable cultural differences in the region (compared with the rest of Ukraine except Southern Ukraine) are more "positive views" on the Russian language and on the Soviet era and more "negative views" on Ukrainian nationalism. During elections voters of the Eastern (and Southern) oblasts (provinces) of Ukraine vote for parties (Communist Party of Ukraine (CPU), Party of Regions) and presidential candidates (Viktor Yanukovych) with a pro-Russian and status quo platform. The electorate of CPU and Party of Regions was very loyal to them. But following the 2014 Ukrainian Revolution the Party of Regions collapsed and the CPU was banned and declared illegal. Effective in August 2012, a law on regional languages did entitle any local language spoken by at least a 10% of the population to be declared official within that area. Within weeks, Russian was declared as a regional language in several southern and eastern oblasts and cities. From that point Russian could be used in those cities'/oblasts' administrative office work and documents. On 23 February 2014, the law on regional languages was abolished, making Ukrainian the sole state language at all levels even in Eastern Ukraine, but this vote was vetoed by acting President Oleksandr Turchynov on 2 March. A February 2015 survey found that eastern oblasts (61%) preferred "second official regional language" over (31%) "state language" status for Russian. The 2012 law on regional languages was repelled by the Constitutional Court of Ukraine on 28 February 2018 when it ruled the law unconstitutional. According to a 2016 survey of religion in Ukraine held by the Razumkov Center, 73.5% of the population in Eastern Ukraine were Christians (63.2% Eastern Orthodox, 8.1% simply Christians, 1.0% Protestants, and 0.3% Latin Rite Catholics), 0.5% were Muslims, 0.3% were Jewish, and 0.3% were Hindus. Not religious and other believers not identifying with any of the listed major religious institutions constituted about 24.7% of the population. It also showed that approximately 55.6% of the population of eastern Ukraine (which in Razumkov's mapping excluded Donbass and consisted of the regions immediately to the west of it) declared to be believers, while 13.4% declared to be undecided or non-believers, and 3.5% declared to be atheist. A 2007 survey by the Razumkov Centre asked "Would you like to have your region separated from Ukraine and joined another state?" In eastern Ukraine, 77.9% of respondents disagreed, 10.4% agreed, and the rest were undecided. Kiev International Institute of Sociology (KIIS) geographic division of Ukraine used in their polls. In a poll conducted by the Kyiv International Institute of Sociology in the first half of February 2014, 25.8% of those polled in East Ukraine believed "Ukraine and Russia must unite into a single state", nationwide this percentage was 12.5%. A November 2015 poll carried out by Rating Group Ukraine in Donetsk and Luhansk oblasts, except in Donetsk People's Republic (DPR) and Luhansk People's Republic (LPR) controlled areas, found that 75% of residents wanted the entire Donbas region to stay in Ukraine, 7% said that it should join Russia, 1% wanted it to become an independent country, and 3% said that DPR and LPR-controlled territories should leave and the rest of Donbas remain in Ukraine. When asked if Russian-speaking citizens are under pressure or threat, 82% said 'no' and 11% said 'yes'. 2% "definitely" and 7% "somewhat" supported Russia sending troops to "protect" Russian-speakers in Ukraine, while 71% did not. 50% wanted Ukraine to remain a unitary country, 14% wanted it to be a federal country, 13% said it should remain unitary but without Crimea, and 7% wanted it to be divided into several countries. If they had to choose between the Eurasian Customs Union and the European Union, 24% in East Ukraine (including Kharkiv oblast) preferred the ECU and 20% preferred the European Union (in Donbas: 33% for the ECU, 21% for the EU). On joining NATO, 15% were for, 15% were against, and most said that they would not vote or it was difficult to answer (in Donbass: 16% for, 47% against). East Ukrainians were less likely to vote in parliamentary elections. ^ All statistics sourced from: State Statistics Committee of Ukraine. ^ "Ukraine Situation report No.33 as of 27 March 2015" (PDF). OCHA. 27 March 2015. Retrieved 31 March 2015. ^ Yanukovych signs language bill into law. Retrieved 2012-09-07. ^ Russian spreads like wildfires in dry Ukrainian forest. Retrieved 2012-09-07. ^ Halya Coynash (13 April 2015). "Bad News for Moscow on the Language Front". Kharkiv Human Rights Protection Group. Retrieved 1 January 2016. ^ a b c РЕЛІГІЯ, ЦЕРКВА, СУСПІЛЬСТВО І ДЕРЖАВА: ДВА РОКИ ПІСЛЯ МАЙДАНУ (Religion, Church, Society and State: Two Years after Maidan), 2016 report by Razumkov Center in collaboration with the All-Ukrainian Council of Churches. pp. 27-29. ^ "Would you like to have your region separated from Ukraine and joined another state (regional distribution)". Razumkov Centre. 18 June 2007. ^ a b c d e f "IRI's Center for Insights Poll: Pessimism High after Two Years of Violent Conflict with Russia; People in the Ukrainian-Controlled Territories of Donbas Want to Remain Part of Ukraine". International Republican Institute. 12 January 2016. 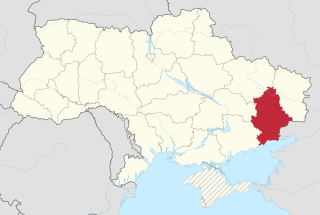 The Donetsk Oblast, also referred to as Donechyna, is an oblast (province) of eastern Ukraine. It is the most populated oblast, with around 4.5 million residents. Its administrative center is Donetsk; however, its Regional State Administration has been temporarily relocated to Kramatorsk because of the ongoing crisis in Donetsk. Historically, the region is an important part of the Donbas region. Until November 1961, it bore the name Stalino Oblast as Donetsk was then named "Stalino", in honour of Joseph Stalin. As part of the De-Stalinization process, it was renamed as its administrative center after Siversky Donets, the main artery of East Ukraine. Luhansk Oblast is the easternmost oblast (province) of Ukraine. Its administrative center is Luhansk. The oblast was established in 1938 and bore the name Voroshilovgrad Oblast in honor of Kliment Voroshilov. Its population is 2,239,500. The Donbass or Donbas, is a historical, cultural, and economic region in eastern Ukraine and southwestern Russia. The word "Donbass" is a portmanteau formed from Donets Basin, which refers to the river Donets that flows through it. Multiple definitions of the region's extent exist, and its boundaries have never been officially demarcated. Alchevsk is a city of oblast significance of Luhansk Oblast (province) of eastern Ukraine. It is located approximately 45 kilometres from the oblast capital, Luhansk. Population: 109,377 (2016 est.). Central Ukraine consists of historic regions of left-bank Ukraine and right-bank Ukraine that reference to the Dnieper river. It is situated away from the Black Sea Littoral North and a midstream of Dnieper river and its basin. The Donetsk People's Republic is a declared people's republic and proto-state in the Donetsk Oblast of Ukraine recognized only by the partially recognized South Ossetia and Luhansk People's Republic. The Donetsk Republic is a pro-Russian separatist political party operating in the Donetsk area of Ukraine. The group's goal is the creation of a "federation of sovereign Donetsk", which would include seven regions of eastern and southern Ukraine. The group was banned in 2007, but this ban was marginal until the 2014 Donbass War. In 2014, it founded the Donetsk People's Republic, which Ukraine's government calls a terrorist organization. The party won the Donbass general elections, 2014 with 68.53% of the votes and 68 seats. This is a timeline of the 2014 pro-Russian unrest that has erupted in Ukraine, in the aftermath of the Ukrainian revolution and the Euromaidan movement. ATO zone, or Anti-Terrorist Operation Zone, is a term used by media, publicity and government of Ukraine as well OSCE and other foreign institutions to identify Ukrainian territory of Donetsk and Luhansk regions (oblasts) under control of Russian military forces and pro-Russian separatists. A significant part of ATO zone is considered temporarily occupied territory of Ukraine.